The phrase “driving with your headlights off” comes to mind when referring to this project. The Michelin Plant in Greenville, S.C., had a substantial infrastructure issue that required rehabilitation. The only problem was that the work needed to be done over the Christmas holiday shutdown and neither of the structures to be rehabilitated could be taken out of service for pre-bid inspections. 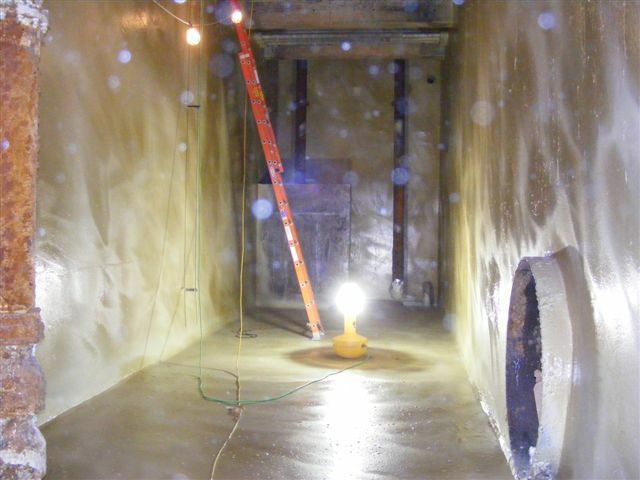 The project consisted of two below-grade, concrete, closed-top cooling tanks. The 10,000 sq ft total surface area was accessible only through two 20 ft man entries per tank. The scope of work included removal of existing 23-year-old liner material and installation of Spraywall by Sprayroq at 100 ml. throughout the structure. When you go in blind, you can only expect the worst. To learn what they were up against, the team at Osborn Inc., a Sprayroq certified partner, needed to remove the existing tank liner. This would allow them to find out how bad the structure underneath had deteriorated. After the existing liner was removed, workers found that due to numerous cracks, water infiltration was much more severe than anticipated. The team dealt with this problem by injecting 500 ln ft of floor-to-wall cold joint, and an additional 200 ft in the wall cracks. This allowed the Osborn Inc. crew to begin pressure-washing the structure. It was at this point when it was determined that 8,000 sq ft of the wall surface needed to be parged by hand trowel to bring the wall up to spec. After all this preparation was complete, Spraywall could be applied to the structure, from 150 to 250 ml. thick in some places. On New Year’s Eve 2008, the scaffolding was lifted out of the hole by a rope through one of the 20 ft manholes, as the last of the Spraywall was being applied. The project was completed on time, with no lost production for the plant.